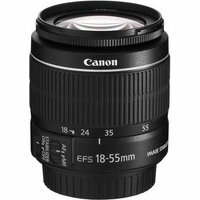 The EF-S 18-55mm f/3.5-5.6 IS II offers Canon DSLR owners the flexibility to shoot everything from sweeping landscapes to portraits. A lightweight construction means it's easy to carry, and Canon's acclaimed optical Image Stabilization offers a 4-stop advantage to ensure sharp images at maximum zoom and when shooting in low light. With a focal length equivalent of 29-88mm in 35mm format, the lens' wide zoom range is suitable for most general photography. For close-up work, the working distance is just 0.25m (25cm) throughout the zoom range.